inspired dress from 1965 taking centre stage here. 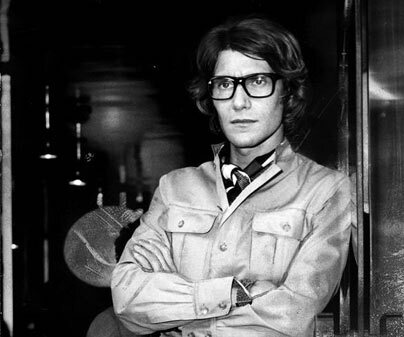 It’s the first time this venue has ever hosted an exhibition of this kind, usually focusing on the fine arts, and it says a lot about Yves Saint Laurent’s position as a French cultural icon that they have been prepared to open their doors to a ‘mere’ fashion designer. But there’s certainly nothing ‘mere’ about this show – it’s colossal; claiming to be the first complete retrospective of the designer’s work, it boasts 300 plus garments displayed alongside films, photographs and sketches fleshing out the background both to the designs and to Saint Laurent itself.Arranged thematically, the exhibition takes Saint Laurent’s early work at Dior in the late 1950s as its starting point, focusing on his first collection, Trapeze, a selection of looser fitting dresses which were seen as a radically liberating the female body. Then there are sections on various haute couture clients, including one of the most loyal Catherine Deneuve – ten outfits made for her are on show here. Other sections look at his interest in the exotic featuring Russian-style coats from 1978 and a strapless evening dress seemingly entirely constructed from feathers (1990). Other sections include one focusing on the role of colour in his work and another on his interest in contemporary art with the iconic Mondrian-inspired dress from 1965 taking centre stage here.